This book can help overcome the widely observed math-phobia and math-aversion among undergraduate students in these subjects. The book can also help them understand why they have to learn different mathematical techniques, how they can be applied, and how they will equip the students in their further studies. 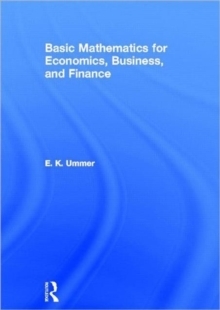 The book provides a thorough but lucid exposition of most of the mathematical techniques applied in the fields of economics, business and finance. The book deals with topics right from high school mathematics to relatively advanced areas of integral calculus covering in the middle the topics of linear algebra; differential calculus; classical optimization; linear and nonlinear programming; and game theory. 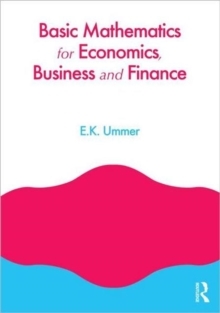 Though the book directly caters to the needs of undergraduate students in economics, business and finance, graduate students in these subjects will also definitely find the book an invaluable tool as a supplementary reading. The website of the book - ww.emeacollege.ac.in/bmebf - provides supplementary materials and further readings on chapters on difference equation, differential equations, elements of Mathematica (R), and graphics in Mathematica (R), . It also provides materials on the applications of Mathematica (R), as well as teacher and student manuals.